Two people posted on the forums last night about taking other peoples' promotional materials with them to various and assorted events. I thought it was an awesome offer of them, and I thought it might be a good opportunity to get the word out to areas a bit farther from the eastern seaboard, where most of our team (EtsyPHAT) seems to be located. I convoed crescentwench and GemsbyJules, and it came to me this morning that I don't really have any promo stuff! 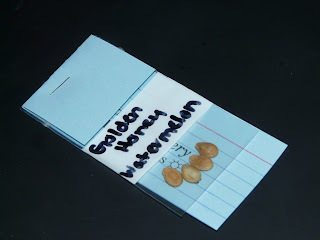 I usually do an extra packet of seeds with orders, but that's with an order. Handing out seeds with the flavor on it doesn't really work for promotion, so I went into a whirl this morning trying to come up with something. I decided to just go with something easy, since I wasn't going to stress about something that I got myself into, all by myself. Then, it became not so easy. The computer hooked up to my color printer is defunct, and my main computer needs to be reinstalled with a stable version before I even start to hack on it. That left me with the black-and-white laser printer on yet another computer. The postgres driver for that printer is pretty gimpy, so I had to do some creative manipulation to get it to print on notecards. 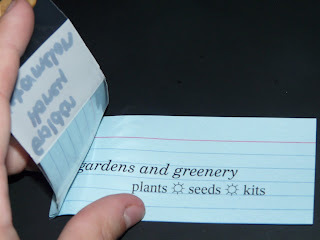 It doesn't realize that you can print on any paper but A measures, so I had to do interesting page alterations to get it to feed through the notecards. The result is simple, unoffensive, and it gets the point across. Not very flashy or cool like the EtsyPHAT ones, but they're excellent for a last minute panic, if I do say so myself. Just had a look through your shop. I like your recycled glass herb garden kit. Neat use of those bottles! New Blog! Go there now.